Chief Raymond Dokpesi, founder of Daar Communication, who contested the PDP National Chairmanship position and lost, has congratulated the winner, Prince Uche Secondus. Dokpesi, who had earlier faulted the process of the party’s National Convention held in Abuja on Saturday, declared that “the delegates have spoken”. “Ì appreciate the delegates for voting at the convention and congratulate the newly elected National Working Committee of the PDP led by Secondus. “You will recall that I said that the PDP must be the ultimate winner at the end of the contest. “God bless the Peoples Democratic Party. Congratulations PDP as I wish all our members the best of luck,” Dokpesi said. 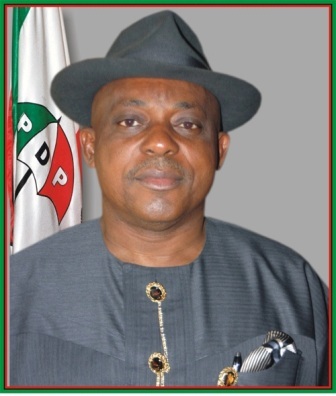 Meanwhile, the newly elected National Chairman of the PDP, Prince Uche Secondus, has pledged that the party, under his watch, would adhere strictly to internal democracy with a deliberate policy to return ‘real’ power to the people. Secondus, who got 2,000 votes out of the 2,396 votes cast, in his acceptance speech on Sunday in Abuja, declared that the era of imposition and impunity was over. “With your mandate, I assure you that all necessary steps will be taken to avoid a repeat of our past mistakes. “We have to lean from our mistakes; by this convention, we are now set to forge a new path for our great party and Nigeria. “Under my watch, internal democracy will be strictly adhered to with a deliberate policy to return ‘real’ power to the people. No more imposition, no more impunity. “Every member of this party can, from this moment, consider him or herself, an equal shareholder in our common destiny,” he assured. He called on all Nigerians to embrace the new PDP and join its quest for a new Nigeria. He also called on old PDP members, who, for one reason or the other, left the party, to please come back ‘home’. Secondus called for the support of his co-contestants, especially the chairmanship aspirants, saying that they were all eminently qualified to lead the party. “I thank you for a worthy contest and for being part of history because this marks the first time a stiff contest of this magnitude is taking place toward producing the leadership of a political party in Nigeria. He said that PDP’s contributions to the growth and sustenance of democracy of Nigeria in the last 18 years were still there for all to see, adding that the best best way to celebrate the memories of the party’s founding fathers was to engage their ideals. Secondus commended the party members for offering him the opportunity to serve, and also lauded the courage of the outgoing National Caretaker Committee led by Sen. Ahmed Makarfi. (NAN).